I changed the Safe Vision app to be free in the end of March. After speaking to an expert on Clarity.fm I decided to let people to watch videos in pre-approved channels for free. If the parent wants to add a channel for their child that requires premium subscription of $23.49 per year. Acquisition – a parent installed the app and signed up for an account. Activation – child watched at least 10 videos on the same or the next day after parent installed the app. Retention – child watched at least 5 videos 2 or 3 days after parent installed the app. 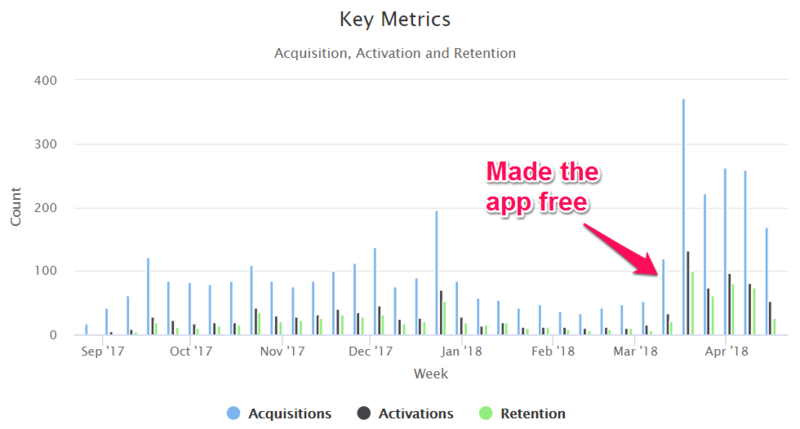 Immediately the number of people that install the app and register for an account (acquisitions) jumped up. The week starting March 19 had a record number of sales: 13. After that sales dropped to about 4 per week. I’m a bit at loss why did this happen. One clue is that 5 out of those 13 parents that paid on that week signed up before March 15. Also I tried to let parents to unlock one channel for free but then I reverted that change. I noticed that many parents would install the app, search for some channel, try to unlock it and hit the Paywall screen. On that screen the app asked them to purchase premium subscription in order to unlock the channel. A lot of parents would not continue using the app and move on after that.